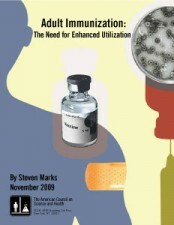 Adult Immunization: What's the Story? Immunization against vaccine preventable diseases is one of the most important and beneficial public health measures available. However, utilization rates among adults remain low, well below Department of Health and Human Services target levels. Nearly 50,000 adults die each year in the U.S. from one of the 10 vaccine preventable diseases identified by the Advisory Committee on Immunization Practices of the Centers for Disease Control and Prevention. Each year, the direct (medical) and indirect (lost productivity) costs of influenza alone top $87 billion, while medical expenditures and productivity losses associated with hepatitis B reach $700 million. The barriers to adult immunization are high and involve a number of financial, informational, and operational obstacles. Vaccines are now available to prevent the most common diseases, including influenza, pneumococcal infections, herpes zoster, human papillomavirus, hepatitis B, and tetanus, diphtheria, and pertussis, although vaccination remains a low priority for both physicians and patients. To address these problems, new public-private partnerships have been formed to increase awareness of the importance of immunization, and additional initiatives are under consideration to reduce the financial and operational barriers to broader vaccine delivery. By Steven Marks, who thanks Litjen (LJ) Tan, William Schaffner, Lisa Jackson, and W. Paul Glezen, four leaders in the ﬁeld of infectious diseases, who offered their time, shared their perspectives, and thus helped ensure that this report would be accurate and useful for readers.